This is a professional quality fan dubbing project. We have a majority of the voices casted but we still need a few more. The roles will be posted here. If you want more details, check out the YouTube page with videos showcasing the quality and more details in the descriptions of the video. Rion is the only adult at Sakimori Academy who isn't an undercover military soldier. She and teacher Kibukawa have close relationship, although Kibukawa always treats her like a kid. She's a bit of an airhead but not too bubbly of a character. She doesn't think too heavily about situations and she's always smiling no matter what. He's a politician. He acts friendly and easy going. Someone you can really talk too and has a very friendly voice. Although he does turn on the children and then everyone hates him. Please, it's no trouble at all. After all, JIOR (G-ore) is an ally of ARUS (R-US) after all. It's the least we could do! Iori Kitagawa is the Sakimori Academy student council vice-prsident. She has a crush on Satomi Renbokoji. The president's not in here! Another Dorssian Military Pact Federation Special Agent. He 's highly respectful of his boss Cain. His name means X1 in German. X-eins has proven to be a skilled tactician, able to find weaknesses in an enemy after only observing it in battle onced eveloping contermeasures for future battles. X-eins dies at the end of season two while fighting with Cain. He's cool calm and collected at all times. He's a strategist and he always speaks properly and respectfully when he needs too. He's a true gentleman but also a deadly soldier. Lieselotte W. Dorssia was the princess of Dorssia, as well as a childhood friend of L-elf. As a child she wore her pink hair up into two side buns. As a teenager, her hair is still kept up but now has been left down into two pigtails. Her eye color is red and she has two small markings underneath her eyes that might be used to distinguish her as royalty. Pino only appears in Haruto's Valvrave and seems to have the strongest control over him. There have been numerous times that after she made the pilot chose to abandon his humanity where she possesses him and causes him to take drastic actions. She has caused the teenager to possess other people's bodies, mainly L-elf's, and to constantly need runes. When she is in need of runes she makes Haruto lose any form of self-control and to savagely attack his peers. Juto Bansho is a character that appears in Kakumeiki Valvrave. He is a Sakimori student. Youhei Onai is a Sakimori student. He was killed when Jeffrey Anderson ordered the massacre of all of the Module 77 inhabitants. 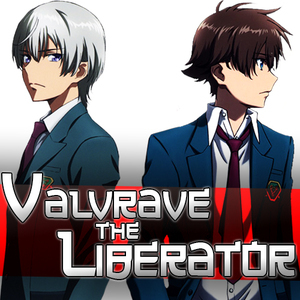 Seiya Kamisugi is a character that appears in Kakumeiki Valvrave. He is one of Yusuke Otamaya's friends. Toru Miyamachi is a character that appears in Kakumeiki Valvrave. He is one of Yusuke Otamaya's friends. Midori Akaishi is a Sakimori student and a member of student council.